Using celebrities to promote occupational therapy - 100 years ago? According to Bill de Lancey (1958), a writer for the Geneva Times, "Mr. Barton was born in Boston, of a family steeped in the arts and letters." Occupational therapists know that Barton was an architect and that he was an important Founder of the profession, but few know about the depth of his other talents and interests. During the early 1900s, while he was encouraging Emily Post's literary career and while he was becoming more established in his own architectural practice, Barton also collaborated with others on musical and literary projects. 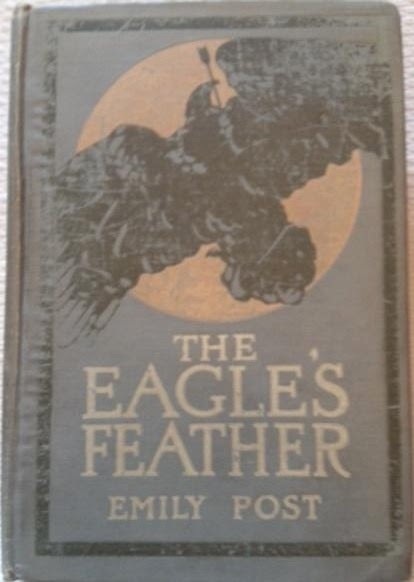 Emily Post continued her literary career and in 1910 An Eagle's Feather was published. I am having a little difficulty with reading the print - it seems that Emily Post is stating her dissatisfaction with something - I was assuming it might be with the cover picture? If anyone has any good guesses on what she was referring to I would love to hear opinions. Whenever I can't read someone's writing I am always surprised to find out how it was so apparent to someone else - and then in looking at it a second time I don't know why I didn't see it! Any help with this is appreciated. In response to questions by members of the Legislature as part of the February 3, 2014 Joint Budget Hearing on the 2014‐15 Executive Budget for Health/Medicaid, the New York State Department of Health Early Intervention Program provided a progress report with the transition to the State fiscal agent. No one stopped to think that self-assessment for progress reporting might not be the most accurate measure. More research on effects of weighted vests on attending behaviors. I was very happy to see another article on weighted vests in the current issue of AJOT (Lin, Lee, Chang, and Hong, 2014). The last opportunity we had to look at this issue was the excellent pilot study completed by Collins and Dworkin and published in the November/December 2011 AJOT. In that study (reviewed here) the authors found that the weighted vests were not effective in increasing time on task, but cautioned that the results should be generalized cautiously owing to the small sample size and participant selection process. The current study, completed by colleagues in Taiwan, employed a much more rigorous randomized and two period crossover design with a much larger sample of children. 110 children participated in the study that measured their performance on the Conners' Continuous Performance Test and recorded behaviors during weighted and non-weighted vest wearing conditions.